My College Options is a free service offered in high schools across the country to help students make the best decisions before graduation. We connect high school students with colleges, universities and other educational opportunities of higher learning that offer the best chances for success. Use our Survey Wizard to manage your survey and find the right school for you. Search for institutions and view the institution profiles. Get tips on college life and how to achieve success. View your personal profile and maintain your contact information. 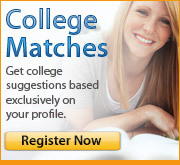 Search High schools and view their profiles. Your online planning guide to College Admissions.